Pisgah Bay is an area in Land Between the Lakes (LBL) in far western Kentucky - a 170,000 acre National Recreation Area managed by the U.S. Forest Service. This isolated forest peninsula with a complex cultural history, bound by the dammed waters of the Cumberland and Tennessee rivers, is a vital reserve for a wide range of species and natural communities in an otherwise agricultural and developed landscape. Unfortunately, the Forest Service has taken an idea with merit – namely, that some plants and animals benefit from fire and canopy disturbance – to a far extreme in an effort to convert nearly the entirety of LBL into a heavily disturbed landscape through commercial logging and an aggressive prescribed fire program. While some species do benefit from the large areas of briars, scrub, and charred trees that the Forest Service has created, others species, like the rapidly declining Cerulean warbler, need old, mature, and unfragmented forest habitat to survive. The comment period for the Pisgah Bay project ended, April 21, 2014. Make sure you know about future proposals at LBL, sign up to receive alerts from Kentucky Heartwood. 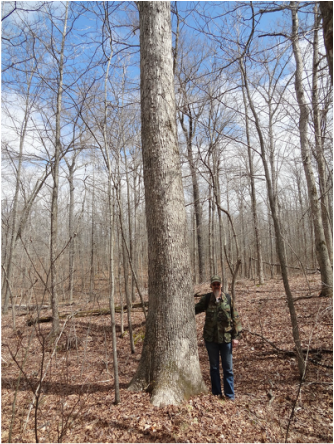 The Forest Service proposed commercial logging of 4,000 acres in the Pisgah Bay area – an area of beautiful oak-hickory forests and emerging old-growth characteristics. Along with logging, the Forest Service proposes 5,000 acres of prescribed fire and an annual 600 acres of herbicide treatments on both non-native invasive plants and native trees considered “undesirable” by the Forest Service. All of this is immediately adjacent to the recently implemented Demumbers Creek project, and its 1,850 acres of commercial logging. The Pisgah Bay area is recovering from the 2009 ice storm, a natural event to which our forests are well-adapted. Though some trees may decline over time, they will continue to provide important habitat as den trees, snags, and large-diameter down woody material, while the many surviving trees will recover. The Forest Service already maintains about 20,000 acres of openlands as hay fields, powerline right-of-ways, commercial cropland leases, and their two designated “Oak Grassland Demonstration Areas.” It’s time for the Forest Service at LBL to realize that forests aren’t the enemy. See pictures of the Pisgah Bay Project area here. Forest Service scoping documents for the project are available here. Read on to learn more about some of the issues. 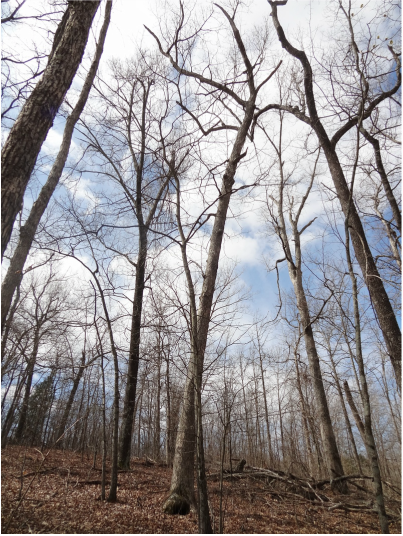 The 2009 ice storm that swept western Kentucky had a variable but substantial impact on the forests of LBL, with the Forest Service already completing several salvage sales elsewhere on the peninsula. Ice storms are a natural phenomenon with which our forests have evolved. They are as natural as wind and rain, an very much unlike chainsaws, skidders, and roads. The Forest Service insists that the Pisgah Bay area needs to be logged because the ice storm "ravaged" the forest and has left an unhealthy forest and unsafe conditions. They state that "Dense forest conditions and large amounts of fallen woody debris on the forest floor has decreased access and visibility into the forest interior." This may have been the case in 2009 immediately after the ice storm, but it is not the case now. Many of the nicest forests planned for the heaviest logging are open, walkable, and beautiful. By contrast, areas that have been logged and burned are often dense with briars and scrub, and very difficult to enter. If you can't visit the forest and see for yourself, take a look at our photo album and make your own judgement. It is also important to note that one of the external indicators of old growth trees is what is known "reiteration" in the canopy. Basically, over the centuries, trees suffer and recover from incidents of canopy damage throughout their life, resulting in stubby and crooked forms in the canopy. Whether thunderstorms, ice storms, or the now extinct passenger pigeon, canopy damage is an important part of native forest dynamics. While some trees will decline and die, they will provide increased habitat diversity as snags and dens, enrich the food chain with insects and fungi, and build soil. Commercial logging, with all of impacts, is not a remedy for a natural process.See pictures of the Pisgah Bay Project area here. The Forest Service admits in their most recent (2012) Monitoring Report that "only 31% of roads were maintained to standard, falling short of our annual goal of 75%." The Forest Service has also failed to meet goals in the LBL management plan (the Area Plan) of decommissioning 1 to 3 miles of road per year. In the Pisgah Bay Project, the Forest Service plans to ADD roads to their system. Area residents who tend to their ancestral cemeteries have asked the Forest Service to maintain at least part of Forest Road 305 (picture on right) so that they can access the Watkins Infant Cemetery, and suggested decommissioning the remainder of the mostly impassable road. Instead, the Forest Service plans on keeping all of FR 305 and adding another road to access the Watkins cemetery - a new road which just happens to be needed to access a major proposed logging area. The proposed road additions in the Pisgah Bay Project are in addition to the 6 miles of "temporary" roads that they plan to build to haul timber out of the forest. Anything but temporary, these logging roads compact soil and spread invasive species into forest interiors, and will be evident for many years to come. See more pictures of the Pisgah Bay Project area here. When the residents of Between the Rivers were removed from their land to create Land Between the Lakes, they were told that their farmland was worthless. Now the federal government leases cropland to private businesses growing corn and soy. These private businesses have paid just $10 an acre when other farmland leases on private land in the region have averaged $78 to $99 and acre. The private businesses have benefited from other government crop subsidies as well. The way the permits have been handled has been an issue of contention and lawsuits. The picture above is a 30 acre corn field in the middle of the Pisgah Bay Project area along Pisgah Creek. The area should be restored to riparian and mesic forest communities, which are underrepresented in LBL since much of this habitat was destroyed to make Kentucky Lake and Lake Barkley. See more pictures of the Pisgah Bay Project area here. The history of fire at LBL is complicated and not well understood. However, it's pretty clear that human-caused fire has had a hand in shaping the forests of LBL over the past several thousand years, and, along with now-extinct megafauna (like woodland bison), in maintaining some areas of more open forest with sun loving grasses and forbs. The Forest Service has taken this idea, and the available evidence, to a far extreme - advancing a management vision that insists the entirety of LBL is essentially a fire-dependent ecosystem. The Forest Service currently burns about 8,000 to 10,000 acres a year. In addition to other logging and burning projects, the Forest Service maintains around 20,000 acres of openland, including 8,630 acres of dedicated Oak-Grassland Demonstration Areas (picture at right). However, they insist that almost all of the Pisgah Bay area (and LBL in general) needs to be logged, burned, and treated with herbicides to mimic "historic" conditions. It should be obvious, but logging and herbicides were never tools of the Archaic and Woodland peoples who periodically lived, hunted, and farmed in the area between the rivers. And, while fire is important and should be used and studied in some areas of LBL, some areas need to be treated more conservatively or left unburned, adding to the diversity of the landscape. See more pictures of the Pisgah Bay Project area here. The term "old-growth" can mean a variety of things, but in general, old-growth forests are associated with a higher degree of structural complexity than younger forests. Old-growth characteristics include a complex and layered canopy structure, large and old trees (for the forest and site type), large diameter snags and den trees, large diameter down woody debris (see a pattern? ), and small and medium sized gaps in the canopy. These characteristics are driven by the interactions of tree growth, small to medium scale disturbance (like ice and wind storms), and time. Many of the forests in the Pisgah Bay area are redeveloping old-growth characteristics and gradually becoming what is known as secondary old-growth. The Forest Service has proposed "regenerating" many of these old forest stands - clearcutting or nearly so the developing forests. Other areas are planned for group and selective harvests to "enhance" the forest, despite the plentiful existence of canopy gaps (in part from the ice-storm damage). See more pictures of the Pisgah Bay Project area here. 1. No commercial logging will be used in the project area, with tree cutting limited to hazard trees adjacent to trails, roads, campsites, and other developed recreation areas. The Forest Service will facilitate the development of mature, contiguous forest cover with natural canopy disturbance in this part of LBL. 2. Prescribed fire will be eliminated or restricted to dry upland sites and the maintenance of hayfields and other maintained openlands, including known locations of Prices potato bean. Valleys and creek bottoms will be allowed to develop into riparian and mesic forest communities that are currently underrepresented in the project area. 3. No roads will be added to the road system, as the Forest Service is already unable to maintain existing roads to established and acceptable standards. The Forest Service should address the unachieved Area Plan goals of both reducing unneeded roads and maintaining cemetery access by decommissioning half of Forest Road 305, while allocating adequate resources toward keeping the remainder passable for cemetery access. All roads, and Forest Road 306 in particular, will be maintained to appropriate standards to address sediment and resource damage or else be decommissioned. 4. Herbicides will only be used on non-native invasive species, and where manual, mechanical, or other non-chemical means are demonstrated to be prohibitive. 5. The 30-acre, subsidized commercial cropland near the mouth of Pisgah Creek will be restored to native riparian and mesic forest types. Other maintained openings will be converted to native grasses and forbs.